Overview - In 1933 New York, an overly ambitious movie producer coerces his cast and hired ship crew to travel to mysterious Skull Island, where they encounter Kong, a giant ape who is immediately smitten with leading lady Ann Darrow. Being a movie reviewer is dangerous business. You never know who is out there, reading what you've wrote, and waiting to take revenge. God forbid you spit on someone's favorite classic -- in my day, I've gotten my fair share of hate mail, from the mundane (one reader actually sent me a rotted pumpkin in the mail for failing to find 'Halloween III' an undiscovered masterpiece) to the near-psychotic (I had to change my email address -- twice -- after an irate veteran apparently didn't like my trashing of 'Pearl Harbor' and predicted I might suffer a premature demise). So it is with great trepidation I go into any review of a film that has a sizable and vocal fanbase. 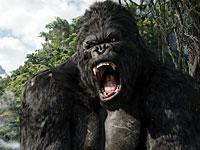 So it goes with 'King Kong,' a film beloved before it even hit cinemas. Thanks to the 'Rings' phenomenon, Peter Jackson is Hollywood's new heir apparent to Steven Spielberg, George Lucas and James Cameron all rolled into one. So, to not like 'Kong' is almost heretical. Sure, the film wasn't quite the gargantuan box office hit predicted, but the faithful still bent over backwards trying to downplay the film's faults and over-inflate its positives. And nothing I can say will likely change anyone's mind. So if you like this movie, skip right on down to the technical portions of this review. Because I hated this heartfelt if woefully miscalculated would-be blockbuster. Painfully overlong, horribly structured, badly cast and containing some of the worst CGI I've ever seen, I couldn't wait for Kong to finally fall off the top of that stupid building and crush Naomi Watts along with him, just so the whole dumb thing would be over with. The story: Ann Darrow (Watts) is a struggling B-movie actress 1920s America. Lovelorn and desperate for big-screen stardom, she hooks up with shady filmmaker Carl Denham (Jack Black), who whisks her and a makeshift crew off to a remote island, in hopes of capturing "exotic" footage for a new potboiler. Along for the ride is Jack Driscoll (Adrien Brody), who is in love with Ann, but she has another, slightly more rotund suitor waiting for her on the island. After a bunch of interminable scenes on a boat involving instantly forgettable supporting characters, the crew is captured by a village of savages, with Ann being served as the main course for Kong. After even more interminable 'Jurassic Park'-lite scenes involving Kong fighting (and fighting, and fighting) with dinosaurs, and Gollum (Andy Serkis) being attacked by giant bugs, Kong and Ann fall in love. Of course, as with all tragic romances, fate intervenes -- Denham cares little for romance, only profit, and soon poor Kong is New York's new star attraction. But love has no bounds, especially when your boyfriend weighs six tons, and the Big Apple now has one very big problem on its hands -- this one won't end happy. Of course, the story of 'King Kong' is a classic. Sure, it's ridiculous -- a woman and a giant ape falling in love? But the power of King Kong has always been that it is a fairy tale, a tragic fable of beauty that killed the beast. Which is why I was so exasperated by Jackson's take on the material. For the first two-thirds of the film's very long 188 minutes, Jackson seems to care little about his two leads. Instead, we get endless subplot after endless subplot, none of which pay off in any meaningful way. It is almost as if Jackson is obsessed with telling the backstories of everyone but Ann and Kong. And the island scenes -- while decent enough as action filler -- also have little to do with the heart of the story. Ann's relationship with Kong is certainly touching -- even a cold-hearted cynic like myself was misty-eyed as our doomed lovers made goo-goo eyes at each other on the edge of a giant cliff -- but it is surrounded by so much banal business that I nearly fell asleep. Yes, I did find a few things in 'King Kong' to like. The film is a handsome production, and whenever anything real is onscreen (a prop, a location, a costume) it hints at the authenticity that might have been. I also continue to admire Watts, Brody and Serkis as actors -- I'm sure they'll look back at this one with a shrug, as the one that got away. With a more streamlined story, less reliance on excessive special effects and a director concerned with humanity and not technology, 'Kong' could have been a classic. Instead, it actually left me nostalgic for that classic camp-fest that was 1976's 'King Kong' -- the one starring Jessica Lange and Jeff Bridges and some guy in a monkey suit. At least that version (as bad it was) knew when to quit. 'King Kong' comes to HD DVD in a 2.40:1 widescreen 1080p/VC-1 transfer, and to say this is a highly-anticipated release is a vast understatement. Nothing less than a five-star, reference-quality presentation will do, which really puts the pressure on Universal to deliver a gargantuan release. I can confidently say that at least in terms of the video, 'Kong' is indeed King. My personal feelings about the CGI notwithstanding, 'King Kong' is a visually sumptuous film. The production design, costumes and physical locations are simply some of the finest Hollywood has produced in recent memory (I guess when you have a $200 million production budget you can afford the best). I remain tremendously impressed by the cinematography by Andrew Lesnie. He gives the film a supple, rich and textured look that is both pristine yet realistic, modern and timeless. The film's luscious color scheme comes through wonderfully on HD DVD. Hues are perfectly saturated and fleshtones dead-on. I don't think I've ever seen greens this lush on my HDTV, and the deep midnight blues and crimson reds are incredibly eye-popping. There is a slight softness to the image that is consistent with Lesnie and Peter Jackson's use of filters and diffused lighting, but it does not affect this transfer's wonderful sense of depth and three-dimensionality. Sure, it is a cliche, but there are moments during 'King Kong' that are picture perfect, where your home theater screen becomes a window. 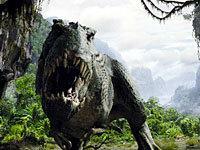 Given the film's extensive computer-generated imagery, some may find fault with the effects-heavy scenes that sometimes look a bit flatter and less sharp. In particular, the heavy motion blur applied to Kong and his various nemeses -- such as the dinosaurs -- does give those scenes a more muted and fuzzy look. But that's the way it goes with today's heavily-processed visual effects extravaganzas, and even the "worst" shots of 'Kong' rival the best of any other transfer I've seen on HD DVD (or Blu-ray, for that matter). 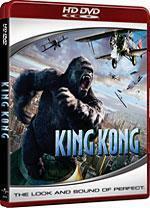 Make no mistake, 'King Kong' is the new next-gen demo disc, at least in my house. Note that 'King Kong' also bears a note of distinction for being the disc title Microsoft is packaging with its new HD DVD add-on drive for the Xbox 360. Though we'll have a more in-depth look at the drive very soon, doing some quick compares between the drive's performance with 'Kong' and my Toshiba HD-XA1 stand-alone HD DVD player, Microsoft seems to have delivered a great peripheral. 'Kong' looks stunning on both, so I'm certainly looking forward to giving the Xbox 360 add-on a more extensive spin. 'King Kong's audio on HD DVD is an oxymoron: it sounds fantastic, while also landing with a bit of a thud. I remain rather shocked that Universal did not include a Dolby TrueHD or some other lossless format on what is undoubtedly its flagship release for the holiday season. If there was only one title out there that needed such a presentation, it is 'King Kong.' Sure, the Dolby Digital-Plus 5.1 surround track (encoded at 1.5mbps) that we do get sounds magnificent, but it is hard not to be crestfallen that 'Kong' doesn't get the best sound HD DVD can offer. Even with the disappointment still ringing in my ears, I can't deny that 'Kong' roars to life from the very first frame. There is nary a scene in the film that you can't whip out to impress your friends -- and that's saying something on a format that currently boasts home runs like 'Batman Begins' in its growing library. Of course, the many bombastic fight scenes and Kong rampages are sonic nirvana. The Kong vs. Dinos scene is a new home theater classic, as is the extended climax on top of the Empire State Building. The 360-degree soundfield that is created is simply flawless and incredibly immersive. As the bi-planes whizzed by poor Kong's head, I kept rewinding, just to hear the fireworks over and over again. Transparency, pans and the sense of detail and realism to the discrete effects is second-to-none -- 'Kong' didn't win the Oscar for Best Sound for nothing. Dynamics are also incredibly powerful, with some of the tightest low bass you'll ever hear, and pitch perfect frequency response across the entire spectrum. But beyond the big action sequences, what really impresses about 'King Kong' is its attention to fine detail. The sense of atmosphere is simply the best I've heard on home video -- ever. 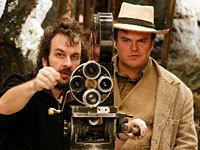 The early scenes with Jack Black and company near the jungle island are alive with ambience and intricate sound effects. And when the crew is first surrounded by the island savages, the wall of sound that envelopes you is a true aural delight. If you have even a half-decent home theater it is hard to imagine you won't be impressed. And despite such over-the-top sound, dialogue is perfectly balanced in the mix. I never once had to adjust my volume control, which is a true rarity for a film like 'King Kong.' I can't think of a more rave review for the audio presentation on this disc other than to say that while I really didn't like 'King Kong' as a movie, I absolutely loved listening to it. Whatever your feelings about the movie iteslf, here is where 'King Kong' on HD DVD really disappoints. Perhaps I've gotten spoiled, but for such a high-profile title, was I wrong to expect most if not all of the same extras that were on the two-disc special edition Universal released last year? And with a new four-disc extended version of 'Kong' about to hit standard-def DVD as well, I am puzzled why the studio didn't release that version on HD DVD along with the theatrical cut. But no, what we get here is -- brace yourself -- absolutely nothing. Nada. Zip, Zero. Universal doesn't throw us a single banana, er, bone -- not even a theatrical trailer. Sure, there is some HD bonus content (see below), but I don't know why the studio didn't ante up for a two-disc set (I can't imagine 'Kong' fans would have minded, even if they had to pay a few extra bucks for the extra disc). As is, supplements-wise, 'King Kong' now pales in comparison to just about every single other HD DVD release out there, when it should of obliterated them. 'King Kong' is undoubtedly one of the most eagerly-awaited next-gen titles so far, which is why I'm rather surprised at the treatment Universal has given it on HD DVD. Certainly, the transfer is absolutely fantastic, but there are surprising omissions. 'King Kong' should boast the soundtrack to end all soundtracks, but no Dolby True HD or DTS-HD option is provided. There are no standard supplements, and while we do get Universal's custom "U-Control" feature, it only contains excerpts from Peter Jackson's production diaries (already released on standard-def DVD in unexpurgated form) and that's old news to fans. I can't help but think this should have been a two-disc set with a second platter devoted solely to extras. In any case, 'King Kong' delivers on the bottom line, but it is far from the reference disc for all of HD DVD's toys that most have been expecting.